"It's yachting, not cruising" has been SeaDream's tagline since the company launched in 2001, but Burger King's old "have it your way" slogan seems to more accurately sum up a cruise on the 4,260-ton, 110-passenger SeaDream II. Want a drink? It's included. Bar doesn't have the beer you like? No worries, a crew member will make a supermarket run in port and pick some up for you. Like this evening's ice cream? The dining team will make sure it's always available for you, day or night. Not seeing your favorite dish on the menu? Tell the chef what you want and he'll have it ready the next day. This desire to tailor your cruise vacation as much as possible to your ideal trip is what makes a SeaDream II cruise stand out. The ship is old and showing a bit of wear, but loyal customers (who can make up a half to two-thirds of the passengers onboard) don't care about the hardware when the software is so good. Crew members are friendly and sociable and cater to your every need -- often before you've thought to ask. The food is outstanding, with a large variety of options, including a robust vegan/vegetarian selection. Itineraries are devised to take you away from the crowds and treat you to off the beaten path gems you'll want to return to again. Nobody wears a tie in the evening, and if the weather is right, most meals are taken outside. Not that the ship is bad, mind you. Sure, the furnishings show their age; the ship doesn't have a modern look and scratches are evident in the wooden cabin furnishings and metal deck chairs. You won't find balcony cabins, let alone infinity pools and tricked-out thermal suites. But you also don't need them. Cabins are roomy and homey with tons of storage space and modern touches like flat-screen TVs and multi-sprayer showers. The alfresco Topside Restaurant with its wicker chairs and cozy dining nooks is the most pleasant place we've ever eaten on a cruise ship. The top-deck Balinese beds are crazy comfortable when you want to read or doze in the sun, and the small spa manages to squeeze in several treatment rooms (complete with top-notch Thai massage therapists), a sauna and salon area. The decks are teak, and the finishes throughout are classy -- no plastic sun loungers here. And you won't have to worry about being nickel-and-dimed. Nearly everything is included from Champagne and cocktails to gratuities, water sports and mountain bike rentals. (Only spa treatments, premium wines and shore excursions cost extra.) Crew members will even lead hikes and bike rides for no extra fee, and beach parties with barbecues, Champagne, caviar and water sports are held on every Caribbean itinerary. You will pay for these things indirectly as cruise fares are quite high, but if you take advantage, you will get a lot for your money. So, what are the downsides? Excursions can be canceled if the minimum number isn't achieved -- entirely possible on a ship that never carries more than 112 passengers. SeaDream II will rock and roll in rough seas; you'll feel the movement even in calm seas. And although the unstructured environment is great for passengers who like their independence and don't want a packed schedule of onboard events, there isn't much to do if it rains, other than read, play cards, watch movies or drink more cocktails. The ship is designed for warm weather -- and intended for folks who prefer to socialize over drinks rather than be entertained by scheduled activities. The biggest drawback is that once you cruise on SeaDream, you might never be able to go back to the bigger cruise ships, no matter how luxurious they are. Once you try yachting, cruising might not ever be the same. SeaDream passengers span a wide range of ages from 30s to 80s. Most are couples, but you'll also find families with older children and friends or siblings traveling together. Passengers are well-off professionals and retirees, well-traveled and stylish. 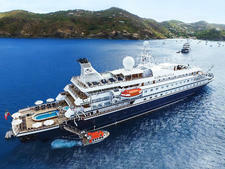 A large percentage will be repeat SeaDream cruisers. The nationality breakdown of SeaDream passengers tends to vary from one cruise to the next, even in the same destination. Caribbean cruises are usually dominated by U.S. passengers, but our sailing had seven nationalities onboard, including English, Australian, Canadian and Norwegian. On Mediterranean sailings, you'll get a broader mix with more Europeans and Australians. "Yacht casual" is how the dress code is described. Men wear collared shirts, either Polos or button-downs, often with boat shoes or loafers. Some choose to wear a jacket, but no one wears ties. Women tend to dress stylishly in the evenings, although still informally, in casual dresses, slacks or capris with a fashionable top, or a skirt and blouse. Stylish sandals, often with sparkly accents, were as common as dress shoes, especially when dining alfresco in the Caribbean. Dinner in the main dining room is generally a tad dressier than dinner under the stars at the Topside Restaurant. Cruise fares include all gratuities, drinks, onboard dining and use of both motorized and nonmotorized water sports equipment (including snorkel gear) from the ship's aft marina. The once-per-cruise Champagne and Caviar Splash party is also complimentary. Passengers need only pay extra for ship transfers, spa treatments, shore excursions, Wi-Fi, souvenirs from the ship's boutique and top-shelf liquor and premium wines.